There are plenty of amazing places to visit in Chicago. As you have seen from my first two days in the city (Day One and Day Two), Chicago tourism is thriving. 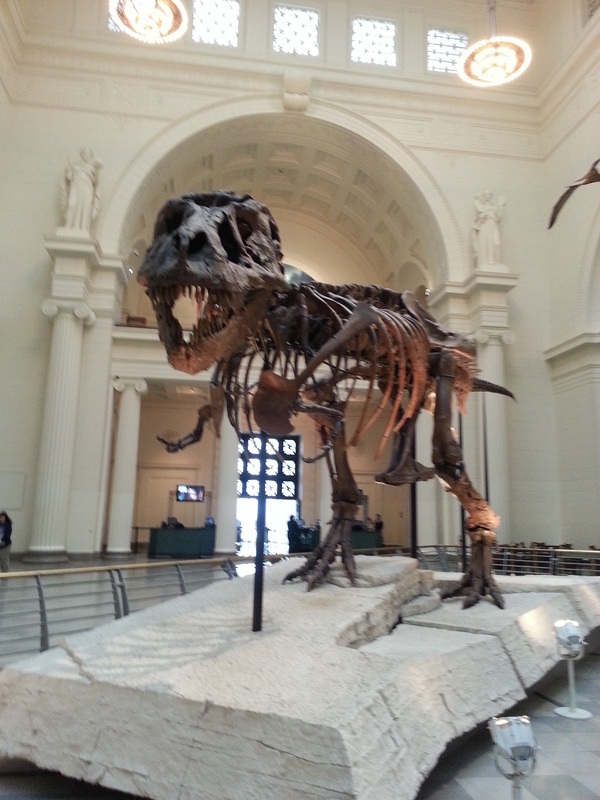 On my last and final day in a perfect trip to Chicago, I like to explore the architecture of the city one last time, as well as visit my favorite dinosaurs. Morning—To get started, I recommend booking a walking tour with the Chicago Architecture Foundation (224 S. Michigan). The “Daniel Burnham: Architect, Planner, Leader” tour gives great insight into the lead architect of the 1893 World’s Fair, as well as his relationship with his wife, business partner, and professionals. 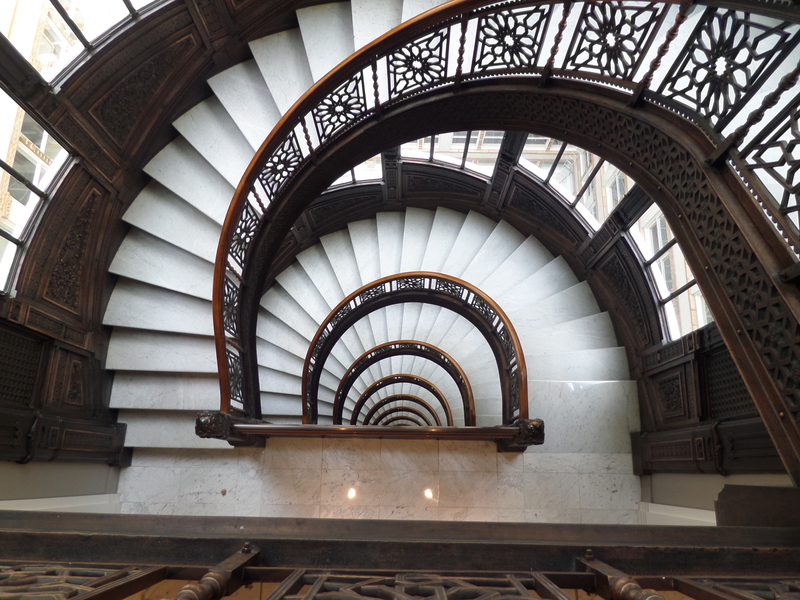 The tour (centered in the Loop) explores some of his better-known works, such as the Rookery, as well as lesser-known buildings. While on the tour, you will also see non-Burnham buildings of architectural importance—don’t miss the Federal Reserve Bank. The Federal Reserve Bank with its Corinthian colonnade conjures images of Greek temples—begging the question, “Why do we build temple-like structures for financial institutions?” Built in 1922 by Graham, Anderson, Probst, and White, its vault was one of the largest constructed at the time. The tour will proceed from the financial district to the Rookery—a masterpiece of architectural innovation—where else does one see a building designed by Daniel Burnham and John Root with remodeling by Frank Lloyd Wright. Other sights on the tour include: Reliance Building, a Chagall mural, Palmer Hotel, Macy’s (former Marshall Field’s), and much more. The tour ends back at the foundation where you are near many eateries and not too terribly far from the Museum Campus (my next recommendation). Side note—At the Federal Reserve Bank of Chicago, visitors can go inside to the free “Money Museum” and learn about the Federal Reserve System, see historical currency, and engage with quite interesting interactive exhibits. Afternoon—After you finish grabbing a bite to eat, a visit to another of Chicago’s stellar museums is in order. 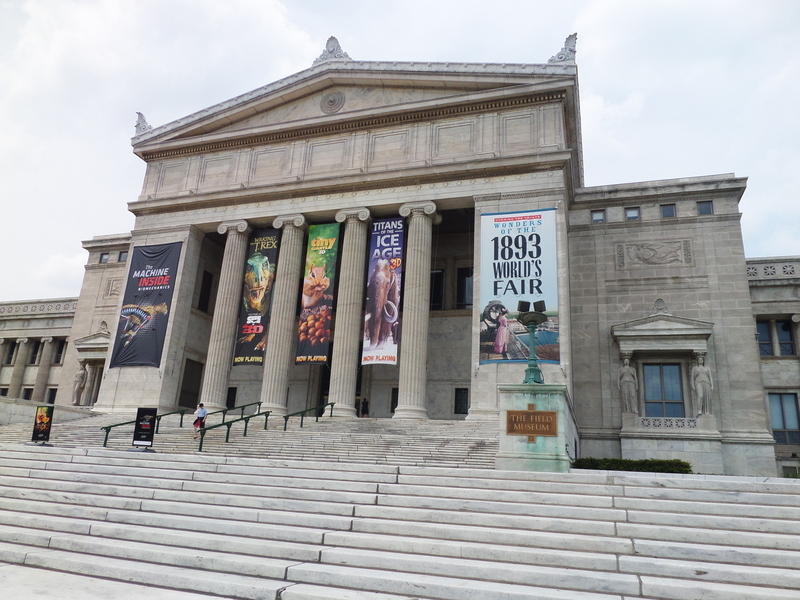 One of my favorites is the Field Museum of Natural History (1400 S. Lake Shore Dr.). The minute I enter this neo-classical gem, I see my old friend, Sue (who happens to be a Tyrannosaurus Rex). The museum has a good Ancient Egyptian exhibit, interesting fossils, artifacts from various cultures, taxidermied animals, and gems galore. Leave at least a couple of hours to explore, because there is a lot to see. If you have children, they will probably find the sights quite exciting. I like how the museum manages to appeal to both adults and children. Also located in the Museum Campus are: the Shedd Aquarium (1200 S. Lake Shore), Adler Planetarium (1300 S. Lake Shore), and Soldier Field—home of the Chicago Bears (1410 Museum Campus Dr.). Dinner—By now, you are probably getting a little hungry and with all the walking that you’ve done, you deserve a hearty meal. I find the Italian Village utterly charming and it’s located near the Palmer House so you won’t have to go far after a long day of exercise (71 W. Monroe). Opened in 1927, this restaurant serves up large portions of just about any type of traditional Italian-American fare that you can dream of. When hubby and I were there last, we were given a romantic little alcove to sit in where we could have an intimate dining experience. The service was exceptional and the food tasty. Evening—On the last night of three perfect days in Chicago, I would be remiss not to include a trip to the theater. 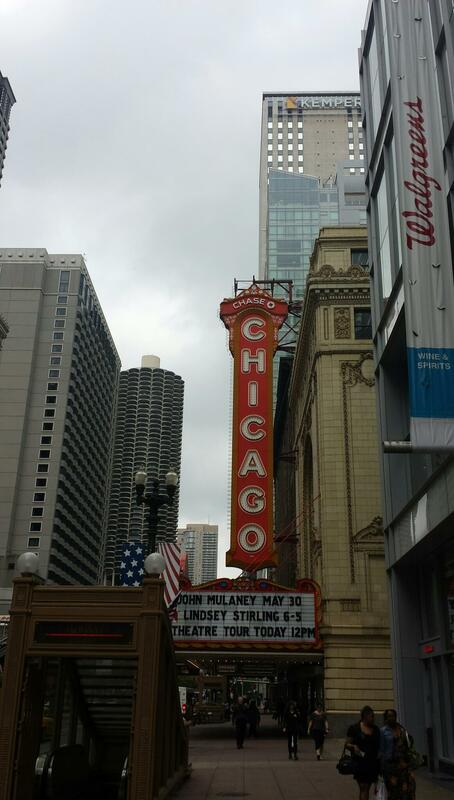 A few blocks down from the Palmer House is the legendary Chicago Theatre (175 N. State St.). Built in 1921, this historic landmark offers a variety of entertainment from concerts to dance performances to comedy shows and more. It is a fitting way to end your trip to the Windy City. I hope that you enjoy traveling through the history of Chicago—I know that I do! I recommend you visit Chicago soon and experience all the great sights of the Windy City. It’s a great city! United sometimes has good sales. They have a hub at ORD. Let me know when you go & I’ll tell you some of my other favorite hotspots.